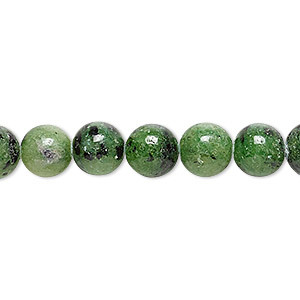 Bead, Kashgar garnet (natural), 6mm round, B grade, Mohs hardness 7 to 7-1/2. Sold per 15-1/2" to 16" strand. Item Number: H20-9790GS Have a question about this item? Discovered in Northern China, this semitranslucent to opaque garnet material is named after the famous city of Kashgar, known as the Oasis City along the "Silk Road" trading route that links Asia from east to west. 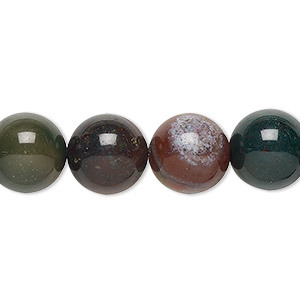 Attention-grabbing marbled red and green earth colors, this stone takes polish well for exquisite shine, adding to its appeal. 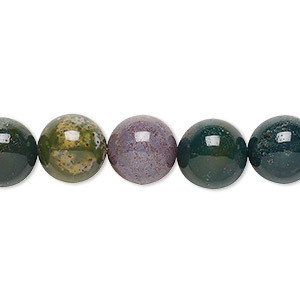 Hard stone for long-wearing jewelry designs that can withstand heavy wear. Colors, shapes and sizes may vary in each lot. 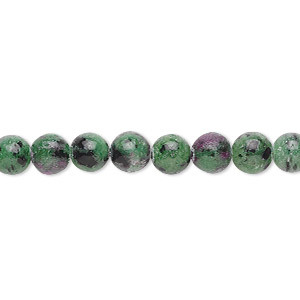 Bead, ruby in zoisite (natural), 6mm round, B grade, Mohs hardness 6 to 7. Sold per 15-1/2" to 16" strand. 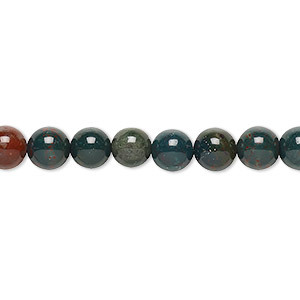 Bead, Indian bloodstone (natural), 6mm round, B grade, Mohs hardness 6-1/2 to 7. Sold per 15-1/2" to 16" strand. 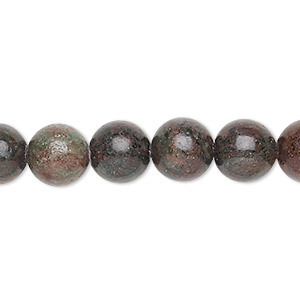 Bead, Kashgar garnet (natural), 8mm round, B grade, Mohs hardness 7 to 7-1/2. Sold per 15-1/2" to 16" strand. 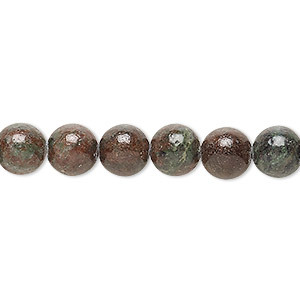 Bead, Kashgar garnet (natural), 10mm round, B grade, Mohs hardness 7 to 7-1/2. Sold per 15-1/2" to 16" strand. 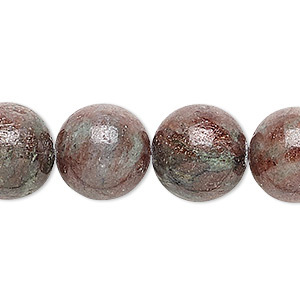 Bead, Kashgar garnet (natural), 12mm round, B grade, Mohs hardness 7 to 7-1/2. Sold per 15-1/2" to 16" strand. 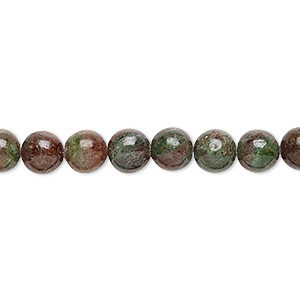 Bead, Kashgar garnet (natural), 14mm round, B grade, Mohs hardness 7 to 7-1/2. Sold per 16-inch strand. 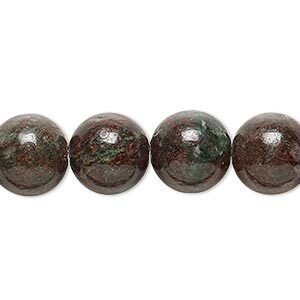 Bead, Indian bloodstone (natural), 10mm round, B grade, Mohs hardness 6-1/2 to 7. Sold per 15-1/2" to 16" strand. 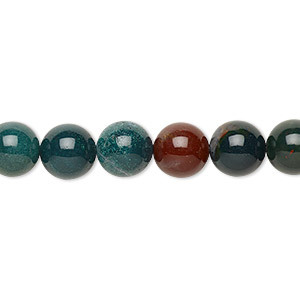 Bead, Indian bloodstone (natural), 12mm round, B grade, Mohs hardness 6-1/2 to 7. Sold per 15-1/2" to 16" strand.